No, I did not found a share-trading club for Vermonters. But I did exchange my cooked meals for delicious vegetable stock for the past 3 days here in the snow-capped Green Mountains! I entered into this stock exchange—better known as a broth cleanse—to give my digestive system a rest, to boost immunity, to shed some lingering cravings, and to reset my intentions before entering into what will be a week of indulgent eating for Vermonters and most Americans—the Thanksgiving holiday. Mainly, I wanted to purify in order give thanks for my health, my happiness and the abundance of nourishing food that is available to me. It’s easy to forget that eating well is a privilege, and I like to remind myself of this. Seasonal cleansing is a grounding and beneficial habit to regularly undertake in one’s life. Broth cleansing is similar to juice cleansing, in that you replace your meals with liquid derived from fruits and vegetables. 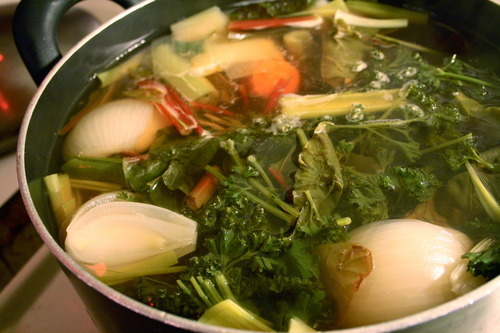 Cold, sweet juice is less than appealing in wintry times, but warm, savory broth helps maintain your core temperature, while providing you with whole vegetable nutrients and a satisfying alternative to a heavy meal. I supplemented my broth with some raw fruits and vegetables, such as carrots, avocado, red pepper, banana, mango, persimmon, coconut, cucumber, apples and radishes. Mindfully snacking on these crudités intermittently and drinking broth when I felt hungry gave me more than enough energy to sustain this cleanse for 3 days! I felt clear-headed, refreshed, focused, and more awake than usual, and slept very well. I also abstained from coffee and alcohol, drank lots of water and listened to my body. 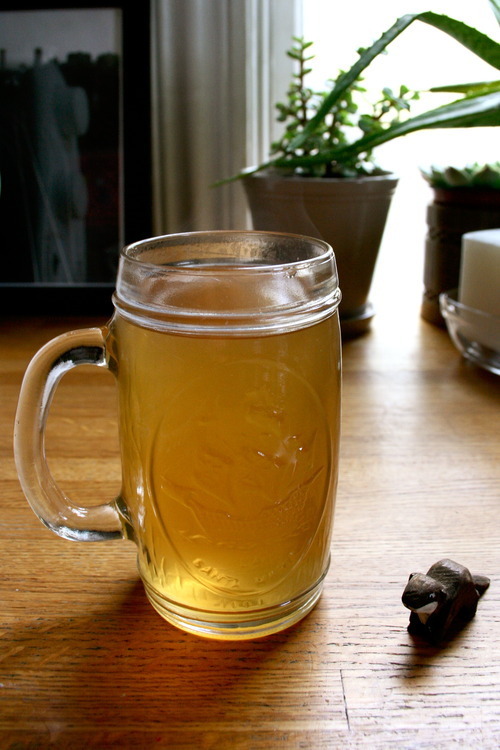 After ending my cleanse this morning, I wanted to share the experience with others, and in particular, how to make the delicious broth that I have been enjoying. 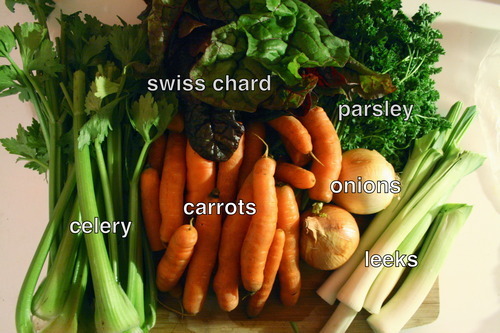 I used this recipe for vegetable broth as a guide, and gathered together two onions, five leeks, a bunch of celery, a bunch of parsley, about 2 lbs of carrots, and a bunch of red chard for my stock. I roughly chopped everything you see in the photo and divided it into two large pots (one gigantic one would have been better! ), covered the vegetables with water, and brought them to a boil. After boiling for about an hour, my stock was ready! Since I wouldn’t need it until the following day, I left it to steep on the stove overnight, and in the morning, I scooped out the large veggie pieces from the broth and strained it into two large jars. 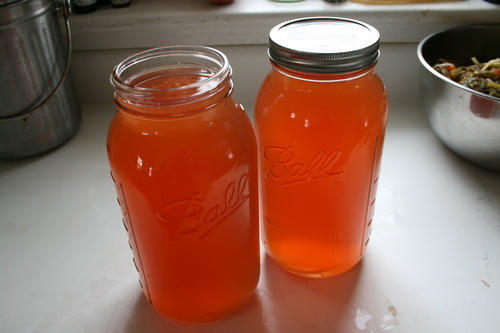 This made more than a gallon of stock, which was plenty for a three-day cleanse. After reheating on the stove, I added a tablespoon of barley miso to my daily quart of broth. Miso provides nourishing protein and probiotics, both of which are beneficial to overall bodily health. I like South River’s Three Year Barley Miso for its rich and deep flavor. If you’re feeling stressed, undernourished, unsatisfied, or simply overwhelmed by your diet, consider cleansing with broth this winter. It’s a wonderful way to return to your center, appreciate what you have and clear your head for more important things in life. And I know that this Thanksgiving, I’ll eat mindfully, gratefully and with a whole heart, giving thanks to the bounty offered up to me. This entry was tagged brothcleanse, givethanks, vegetablestock. Bookmark the permalink.